Time to share another finished project :). I painted this girl to take part in the Golden Vinci contest from dieVincis blog. 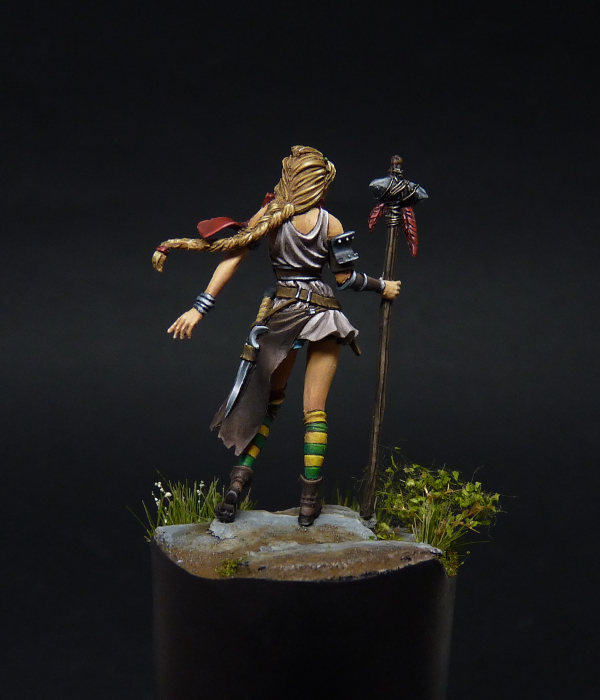 This is a miniature from Kingdom Death, and while I really love their female miniatures I never really dared to paint them. Isn’t that a stupid thing? You like the mini so much that you’re afraid you won’t be able to do it justice! In the past few years I have managed to overcome that, thinking that it is even more sad to keep those pretties unpainted. So then I decided to just paint whatever I liked, however I liked :). (Commissions aside of course, love doing those but you have to consider your costumer’s wishes). The Savior model always spoke to me, but sadly I never managed to get my hands on one. But luckily she was re-released a few months ago. When I was thinking about the colours, it struck me that the concept art was really perfect so why would I want to make it any different? I decided to paint her in similar colours as the concept art, and in the end I am really pleased I did because it turned out exactly as I hoped for. Then came the decision about the base. I never really loved making bases, so I always postponed making & painting those until the mini is finished. This time was no exception, yet it turned out even harder than ever before. I was suffering from a genre dilemma. Is she fantasy? Or steampunk? or maybe more apocalyptic? Some elements to the mini made her a little schizophrenic to me. That’s what I loved about the model to start with, but it made the basing dilemma harder. At that time I started reading Terry Brooks again, and as a huge fan I decided to go for that fantasy setting from the first books. As the mini is already quite busy in terms of details and colours, the base would be simpler, but not boring so I decided to make a stone/grass base. Then when it was time to place her to the base, I became a little hesitant: Would it work? Well, I would leave it up to you to judge, but I was pretty happy with how it turned out in the end :).